The look of this image is one of my favorites. 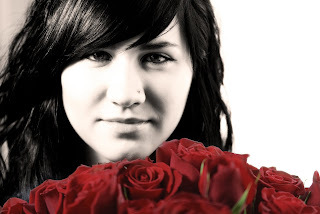 I love the close up photo with the beautiful lady graced with roses. This image was shot with a sliding glass door as the back drop and I exposed for her face, with my flash off camera to her right. The light rolls off her face giving just a hint of the curves of her face. This caused the background to overexpose and go white. I converted it to black and white with a light sepia tone to the image. The red was brought back into the roses using photoshop and a layer mask.